This image of the active sunspot group 1121 on the sun shows the solar hotspot as a bright white region in the lower left as seen by the sun-watching SOHO space observatory on Nov. 5, 2010. 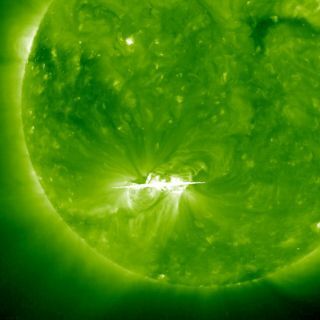 A major solar flare erupted from the sun Saturday — one of the most powerful in years — sending an energetic blast of X-rays from a hotspot of activity that may still belch more solar storms in the days to come. "Astronomers who study the sun have five categories of flares: A, B, C, M and X," explained SPACE.com's skywatching columnist Joe Rao. "The M and X flares are the most potent types and the one that erupted [Saturday] was an M 5.4 which is just about the most powerful flare we've seen in many years." At the time of the flare, sunspot group 1121 was on the limb, or the edge, of the sun's disk, so any cloud of electrified particles ejected by the flare would not reach Earth, Rao said. "But as the sun rotates, this active region of the sun will be turned more and more toward the center of its disk … it will be there around Nov. 12 to 13," Rao said. "If a similar M-class flare erupts around that time, we could be in line to see a very nice display of northern lights a day or two later when the cloud of electrified solar particles reaches Earth." According to the website Spaceweather.com, which monitors space weather and sky events, the radiation from the solar flare "created a wave of ionization in Earth's upper atmosphere that altered the propagation of low-frequency radio waves." Severe solar flare events can cripple satellites and pose a risk to astronauts in orbit, and also have the potential to knock out power grids on Earth. NASA recently began a project, called the Solar Shield, to provide early-warning alerts to electricity providers to help limit damage to power utility infrastructure as a result of extremely powerful solar storms. The sun is currently entering an active period of its 11-year solar weather cycle after a lull in activity.